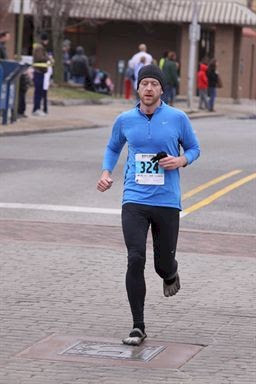 So the Wal-Mart Bentonville Half Marathon was this Saturday in Bentonville, Arkansas. I originally signed up for it because I thought it would be a great spring half to do with warm weather- turned out Arkansas weather can be variable in March... At the start of the race it was about 38 degrees and misting rain. I warmed up for 15 minutes before the start, jogging around the the parking lot where our car was. We had to wait for a while at the starting line, though, so I got pretty cold waiting there. The Injinji socks worked well to keep my toes warm while running, but at the start they were definitely starting to get COLD! I was shooting for a time of around 1:24 but forgot my watch at home. I started somewhere in the middle - this was a mistake because it took a while to run through a big pack of runners. I did not know how fast I was running until there was a clock at the 10k point- 42:17. I still was not warming up... I picked up the pace a little from there but knew there was an impressive hill at the end of the race. I finally started feeling warmed up and ready to run hard around 10 miles. When I got to the hill (around the 12 mile mark) I ran up without stopping; it was steep but very fun and challenging - I passed two other runners here. I finished in 1:29:57 feeling like I could have run a bit faster. Results were posted already- I was in 29th place at the 10k point. 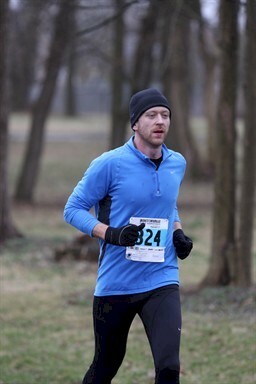 Ended up 22nd overall out of 888 runners; 4th out of 60 in my age group. Also - I had an interesting conversation with the race director/ local running shoe store owner Mike Rush (http://rushrunning.com/) about my Vibram Five Fingers Sprints that I was wearing. While wearing a head-mounted video camera he politely informed me that I was pronating while wearing my VFFs. I told him that a fair amount of pronation is normal during running gait and it is just your arch supplying you with energy. He then told me that I would have problems and would get injured soon. I explained that I have been running in them exclusively for over two years now and haven't had problems with the VFFs yet. I have even done two marathons, two half marathons and a handful of 5Ks and 10Ks so far... He seemed to be caught off guard about the fact that I had done two marathons in them and was still healthy- but quickly asked what the times were. I told him 3:24 and 3:06. He told me that he knows biomechanics and that I will get injured- and that he refuses to carry VFFs in his store because he does not believe in them. I told him that I have my MS degree in Exercise Science and my thesis was on barefoot running- I have done a lot of research and I think I'll be okay. It was an interesting conversation, though. Usually I get asked by curious people what it is like to run in them and if they have any arch support, etc. but nothing like this. Thought I would share this. Yes, the running shoe store owner was very anti-VFF. I'm still loving the VFFs though - 3 marathons and 3 half-marathons and doing well! !